The index at the back of the book is very easy to use. You can look up Korean verbs by their romanized or hangul form as well as their English meaning. The publisher includes the corresponding audio files for the dictionary form of each verb and for all of the example sentences. I tend to learn better with audio, so I found this to be a helpful addition. Pronunciation of all of the conjugations would have been even better, but I suppose that would make for a very long CD! The sample sentences are great for mastering the various verb forms and picking up new vocabulary. Combining these sentences with the audio would be a good way of consolidating your knowledge. A book covering various advanced verb forms, including causative and honorific usages, should safely assume that learners have mastered the hangul by now. It’s a minor point, but this book would be considerably easier to read without the distraction of romanization for every verb form. 500 Basic Korean Verbs is an essential book for your Korean studies. Whether for learning vocabulary or writing out emails, it will come in handy. You can pick up the Kindle version of this book here. 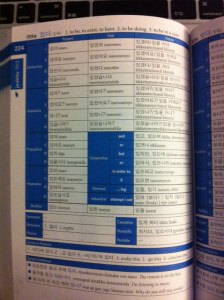 Full disclosure: We received a free review copy of 500 Basic Korean Verbs from Tuttle Publishing. Have you also used this book for your Korean studies? If so, we would be interested to hear your opinion about it. Please leave your thoughts in the comments section below. We are planning several updates for the site in the near future. Like us on Google Plus or Facebook to stay in touch with what we are doing!